Village signs is a series of caches based on the ornate signs that depict the heritage, history and culture of the villages that put them up (normally on the village green). Chislehurst has two such signs, so this Wherigo joins the two signs, and in doing so fills in a physical gap between my other three central Chislehurst Wherigos. Wherigo Church Micro 4636 - Chislehurst Christ Church covers the Mill Place area; Wherigo Church Micro 5651...Chislehurst - St Patrick takes in the High Street area and the northern part of the common and Wherigo Chislehurst Constitutional covers Royal Parade and the southern part of Chislehurst. The Wherigo cartridge takes you on a walk of about one and a half miles (2.5km) on the flat and can be completed within 45 minutes. 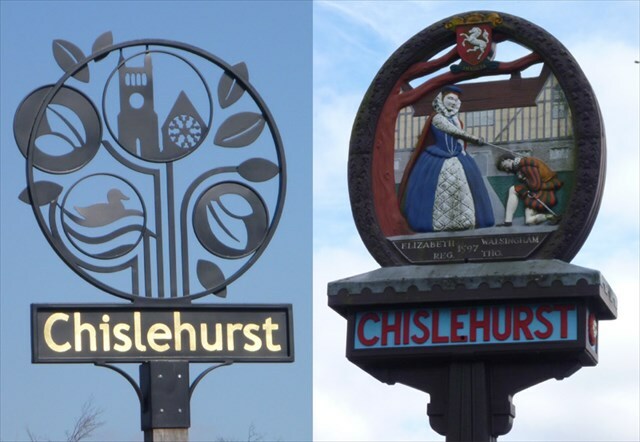 You will visit eight locations including the final physical cache; at the first seven you will meet a previous resident of Chislehurst. You must sign the log of this cache if you want to log your find on the Geocaching.com website. The cache, a film can in a host, is not at the given coordinates. To find the location of the cache you will need to undertake the Wherigo. On the route round you will go very close to the start of a few other geocaches - I'll point some of them out in the cartridge. At each zone, you are required to answer a simple question about things you can see in the locations you visit. If you get the answer wrong, you will be able to try again, or you can skip the question. You can only skip one question as you go round if you want to complete the cache. I have made the zones large because of tree cover - so you may need to walk around the area a little to find the answers. If you experience any problems, try walking outside the zone you are in and re-entering the zone. Some of the questions are multiple choice, particularly where someone may be sitting on the answer. Find out more information about Wherigo caches here. Download the cartridge you need to play the VS#566 Chislehurst Wherigo here. This cartridge was created using Earwigo. WARNING: The area is busy and there is plenty of traffic around - please take care, particularly if you have children with you. You will need to cross the main roads. Much of the route is on paths through the woods, which can be very muddy.